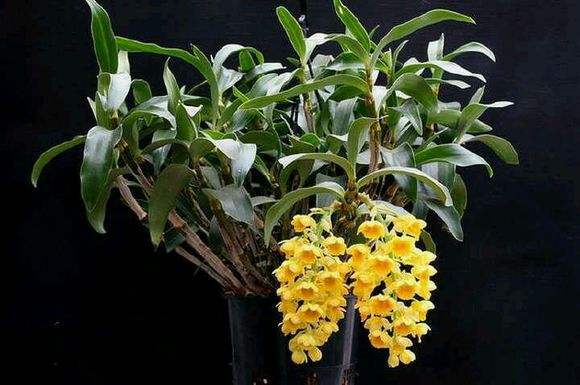 Dendrobium Garden » Dendrobium densiflorum Lindl. 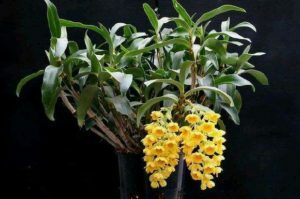 browse:Home Dendrobium Dendrobium densiflorum Lindl. 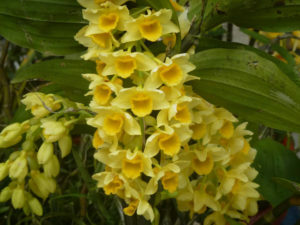 Dendrobium densiflorum Lindl. is a herbaceous plant. Stalks stout, usually rod-shaped or spindle-shaped, 25-40 cm long, 2 cm thick, often narrowly cylindrical at the lower part, unbranched, with several nodes and 4 longitudinal ribs, sometimes not evident, Pale brown and glossy; leaves often 3-4, nearly terminal, leathery, oblong-lanceolate, 8-17 cm long, 2.6-6 cm wide, apex acute, the base does not extend to the sheath of the sheath . Inflorescences racemose basally 2-4-sheath at base of inflorescence; bracts papillose, obovate, 1.2-1.5 cm long, 6-10 mm wide, Apex obtuse, with ca. 10 veins, slender; pedicel and ovary white-green, 2-2.5 cm long; flowers spreading, sepals and petals yellowish; middle sepals ovate, 1.7-2.1 cm long, 8-12 wide Apex obtuse, with 5 veins, entire; lateral sepals ovate-lanceolate, subequaling greater than middle sepals, apex acute, with 5-6 veins, entire; calyx sac nearly spherical, width 5 Mm. Petals suborbicular, 1.5-2 cm long, 1.1-1.5 cm wide, base shortly clawed shortly clavate, middle to superior margin rodent, with 3 main veins and many branched veins; lip golden yellow, rounded rhombic, 1.7 -2.2 cm, 2.2 cm wide, apex rounded, base shortly clawed, basal pistils on both sides below middle, densely velutinous above middle and below; limbs orange, ca. 4 mm; Orange-yellow, hemispherical or conic, flattened anteriorly and posterior, truncate at anterior margin, and subtlely nicked. Flowering from April to May. Born in 420-1000 meters above sea level in the evergreen broad-leaved forest trunk or rock on the valley. Production in northern China (Nankunshan, Lechang? ), Hainan (Sanya City, Lingshui, Baoting, the East, Ledong, Pak Sha, Qiongzhong), Guangxi (Fangcheng, Shangsi, Guiping, Rongxian, Jinxiu , Meltwater, resources counties), southeastern Tibet (Medog). Distributed in Nepal, Sikkim, Bhutan, northeast India, Myanmar, Thailand. Specimens were taken from Nepal. Dendrobium densiflorum Lindl. is a kind of hi-perennial herb that likes shades of cool. It is better to grow in the warm and humid subtropical forests with the annual rainfall of more than 1000 mm, half-shade and half-yang environment and January mean temperature above 8 ℃ , Suitable for growing temperature of 15 to 28 degrees, suitable for growing air humidity above 60%, less demanding on soil fertility, wild and more in the loose and thick bark or trunk growth, and some also grow in the crevice. Is an aerial root, the main requirements of the root permeability is good, the best substrate to breathe air ventilation, in the appropriate temperature and humidity, fast growth, survivability is very strong. Spring and early summer each year, biennial stems on the section of the inflorescence, flowering stems grow into new stems into stems, autumn and winter into the dormant period. Winter season into dormancy.